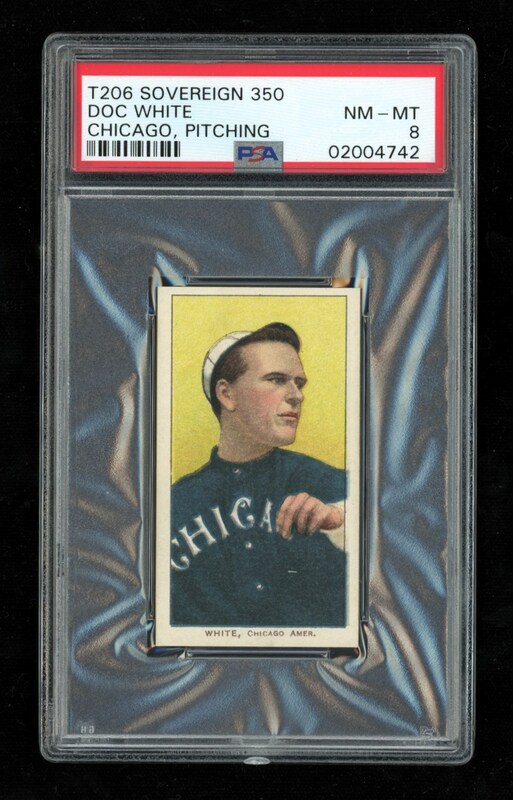 Lot # 13: 1909 T206 Doc White “Pitching” Sovereign 350 Subjects (PSA NM/MT 8) - “1 of 1 & HIGHEST GRADED SOVEREIGN CIGARETTES WHITE! 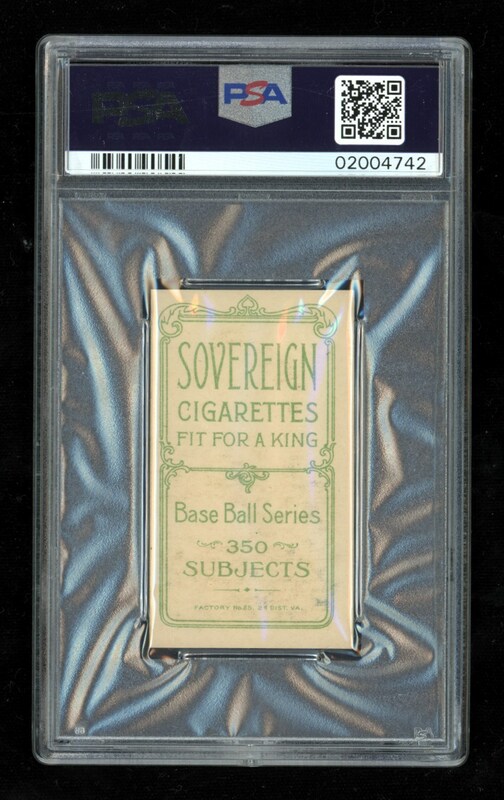 1909 T206 Doc White "Pitching" Sovereign 350 Subjects (PSA NM/MT 8) - "1 of 1 & HIGHEST GRADED SOVEREIGN CIGARETTES WHITE! This spectacular PSA NM/MT 8 Doc White "Pitching" Sovereign 350 Subjects gem just happens to be the SOLE & HIGHEST GRADED example extant! Furthermore, not only does this pinnacle offering stand alone at the top of the Doc White Sovereign 350 PSA list; its lofty assessment has not been surpassed by a single other Doc White 'Pitching" subject, regardless of its back advertisement". White was one of the finest southpaws of his era, compiling 190 lifetime wins, and leading the league with a microscopic 1.52 ERA in 1906 when the upstart White Sox upset the Cubs in the World Series. Amazingly, he claimed 13 "1-0" wins in his career including an 11 inning 1-0 victory over the immortal Walter Johnson, with his 27 wins leading the league in 1907. His brilliant pitching image highlights this "unique for the grade" marvel with the classic pose literally "jumping off he card" via its radiant yellow background. The illustration does slightly favor the upper edge between four snow-white borders and razor-sharp edging, and both surfaces provide pristine-like aesthetics. Its final superlative is a near-immaculate Sovereign 350 Subjects verso that coupled with its "one of a kind" assessment places this offering at the top of the illustrious PSA "pop" charts!